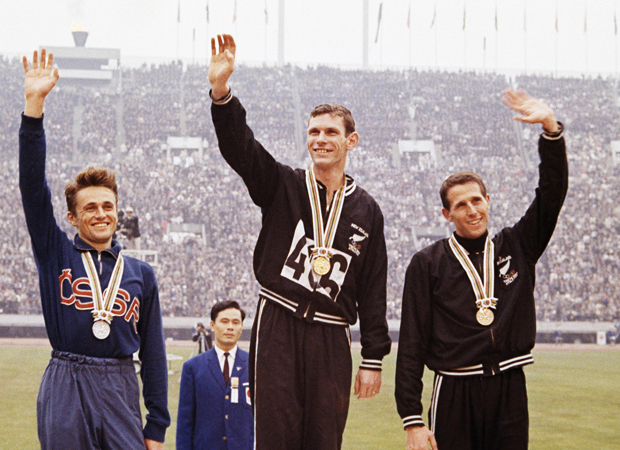 David Leggat recounts how New Zealand has won each of our 43 Olympic Games gold medals. Today - Peter Snell's double to hockey gold. The Snell who arrived in Tokyo was vastly different from the 1960 version. He had been a world champion, was regarded as an athletic colossus and was expected to win. He expected himself to win In the semifinals, Snell won his race, but Jamaican George Kerr and Kenya's Wilson Kiprugug jointly set an Olympic record, 1:46.1. The challenge was thrown down. In a thrilling final, Snell won in a new record 1:45.6 but the next three runners - Canadian Bill Crothers, Kiprugut and Kerr - all broke the previous Olympic mark. ''In Rome it was exhilaration; in Tokyo it was relief," Snell said later of his contrasting 800m gold medals. Five days after winning his second consecutive 800m crown, Snell lined up in the 1500m final. He'd rarely raced the distance but it proved easily the most convincing of three Olympic golds. With around 250m left, Snell simply surged clear of the field and won in a canter, clocking 3:38.01, with Czech runner Josef Odlozil 1.5s back and fellow New Zealander John Davies claiming third in a photo finish. Within a year, at the peak of his running powers and the most dominant running figure of his generation, Snell, just 26, retired. His winning time in Tokyo was more than 2s faster than the winning time in the 1992 Olympic 1500m final. He would have been sixth in the 1996 final. Snell, knighted in 2009, was named New Zealand's sports champion of the 20th century in 2000. Danish-born Pedersen and Wells were the second important figures in New Zealand's Olympic sailing story. The 20 foot dinghy was the first to use trapeze gear and was quick. In its second edition at the Olympics, Pedersen and Wells won three of the seven races sailed by the fleet of 21 boats and were comfortable winners of the gold ahead of Britain's Keith Musto and Tony Morgan, with Americans Buddy Melges and William Bentsen third. By the 1996 Olympics, the Flying Dutchman had been dumped from the Games. Pedersen died of lung cancer in 1987. Considering New Zealand's eminent place in modern world rowing, it's worth remembering this was the first Olympic rowing medal won by the country. It was a considerable achievement, as they had only been in the boat together for four months before the Games in Mexico. Then there were issues working out the seating. But when it counted, the four, coxed by a youthful Simon Dickie, were outstanding, in front by the end of the first quarter and holding on to beat East Germany and Switzerland for the gold. The quartet were inducted into the New Zealand Sports Hall of Fame in 1990. Among the most storied of New Zealand's Olympic gold medal successes happened at Feldmoching, Munich. New Zealand had won the European title a year earlier and were among the favoured crews, but the prospect of holding off the major eastern bloc nations was daunting. They were buoyed by the silver medal won earlier in the day by the coxless four. The New Zealand eight, a mix of veteran rowers and relatively young men got their noses in front early, were in charge at the 1000m mark and hung on for a famous victory. They clocked 6min 08.94sec, almost 3s faster than the United States with East Germany third. The International Olympic Committee president, Avery Brundage, a fierce defender of the amateur sporting ethos, was so thrilled by the win over the 'professional' East Germans, he handed out the medals himself. The occasion was made more significant for being the first time God Defend New Zealand was played at the Games as the flag was raised. Big, brawny men had tears in their eyes on the dais. Jack Lovelock started the tradition; Peter Snell carried it on; and John Walker gave New Zealand its third 1500m gold medal in Montreal. Walker was already world mile record holder and had run one of the great races of the decade at the Christchurch Commonwealth Games two years earlier, finishing second to Tanzania's Filbert Bayi, when both men broke the old world mark. The tall Aucklander with the long stride and flowing locks was a spectacular sight in full cry and was favoured to win the gold. Still, the pressure was immense. As it happened, the race was a slow run contest, with a 62s first lap. With 300m to run, Walker eased clear and held on to the finish line, recording 3:39.17. Belgian Ivo van Damme was second .10s back, although Walker was never under threat. Walker went on to be the first man to run 100 sub-four minute miles. This was the gold no one saw coming. New Zealand were a well-regarded hockey nation, but not fancied a threat to win the gold medal and that seemed to be borne out in pool play when they were thumped 5-2 by Pakistan and drew with both Spain and West Germany, beating only Belgium. Indeed they had to beat Spain in a playoff to make the top four. In the semifinals, New Zealand caused an upset, beating the Netherlands 2-1 in the third period of extra time before facing Australia for gold. Captain Tony Ineson scored from a penalty corner shortly after halftime. Then it was a case of grimly hanging on against waves of Australian attacks. Goalkeeper Trevor Manning had a kneecap shattered, blocking one hammer shot, but stayed at his post. Arms were flung high at the final whistle. "I felt we had a chance before the tournament," said outstanding half Selwyn Maister. "We had a lot of experience in the side, we were well-drilled and very fit. And the fact that the tournament was being played on Astroturf for the first time was an advantage to us. It was a relatively foreign surface for everyone, a leveller." It remains the only Olympic hockey medal New Zealand have won.